Calling all beer lovers, beer snobs, and good ole beer drinks! Summer is coming and there is nothing better than enjoying the beautiful Texas sunshine with a cold brew and great company. 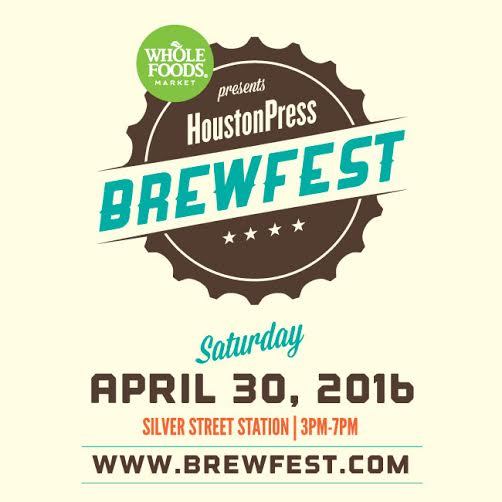 So grab your friends and make plans to attend the 5th Annual Houston Press BrewFest presented by Whole Foods Market on April 30. Here are 10 reasons why that’s a great decision. Beer. Obviously the beer at Brewfest is going to fantastic and is going to feature over 100 different beers! We see fan favorite Texas Beer Refinery on the list and can’t wait to see what other great local breweries are going to show up! Even the pickiest of beer drinkers will be satisfied. Food. Houston food is bomb and the Buttz Food Truck and Fuzzy’s Taco Shop have promised to make an appearance to compliment all your beer drinking needs. More to come as well! Live Music. Beer tastes better when there are local musicians playing the background. It’s a scientifically proven fact. Especially when they are from Texas. Tastings. Speaking of taste, with your ticket you’ll get to sample eight 3oz beers. And if you can’t find a beer you like after all that, you’re more than welcome to buy more tasting tickets (and full sized beers!) at the event. Timing. It starts at 3pm (2pm for VIPs) so you can sleep in and enjoy leisurely weekend brunch beforehand. The planning committee clearly had your best intentions at heart and gave you plenty of time to rally from Friday’s adventures. VIP. If you want to be a very important Brewfest goer, you can! VIP ticket includes Early Admission at 2PM and access to a VIP Area that will be serving up specialty beers and complimentary appitizers. If you want first dibs on all the great beer at Brewfest, this might be the option for you. Fun. Check out last year’s Brewfest video – picture proof of all the excitement they’ve promised in addition to crazy things like giant beer pong and billards! Partners. Your favorite Houston blog (ahem, It’s Not Hou It’s Me!) has partnered with Brewfest! Check us out on their page here! We’ll be drinking all of the brews – will you be joining us? Popular. That’s what this event is (see reasons 1-9). Be the cool kid on the block and get your tickets now. Tickets will be sold at the door day of if they’re still available. However, this event has sold out in the past- so don’t count on waiting till the last minute! Get tickets here. Tags: beer, Brewfest, BrewFestHOU, craft beer, day drinking, festival, houston, Houston Press, Texas, Texas Beer Refinery, Whole Foods Market. Bookmark the permalink. as a partner, I’m hoping y’all can make sure they have some GF beers for your followers!